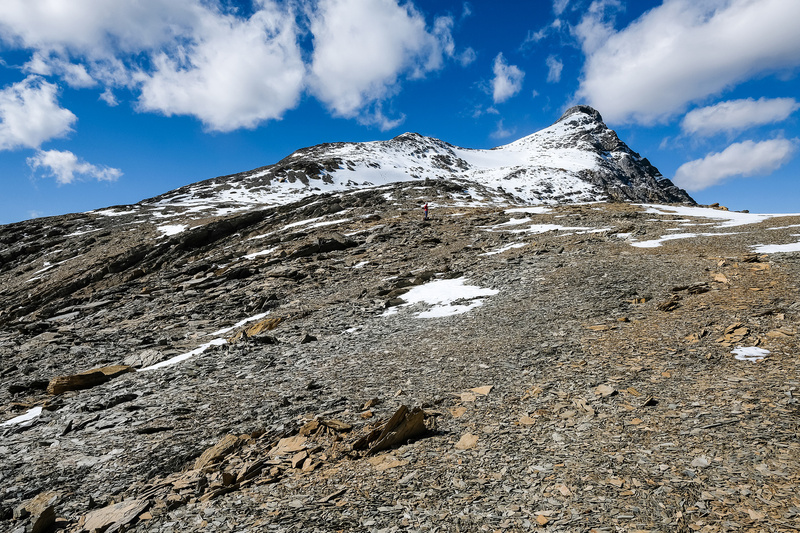 Difficulty Notes: Some moderate scrambling and route finding in loose slabby terrain. Possible steep snow on scree to Biddle Pass. Not quite as easy as the guidebook implies. I’ve been eyeing Park Mountain before I knew what it’s name was. 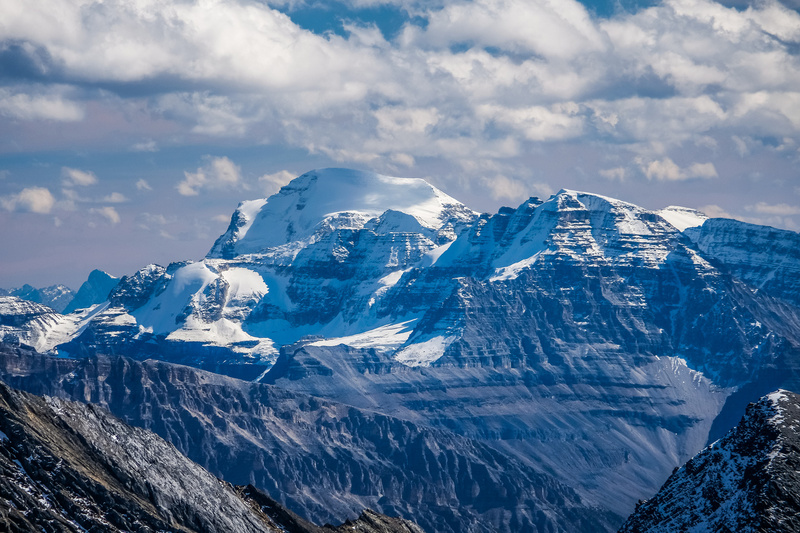 The first time I hiked up Mount Schaffer I wondered what that nice mountain to the south, across McArthur Lake was and whether or not it was a scramble. Over the years I learned that it was called “Park Mountain” but never did read any detailed online trip reports from anyone who’d done it. 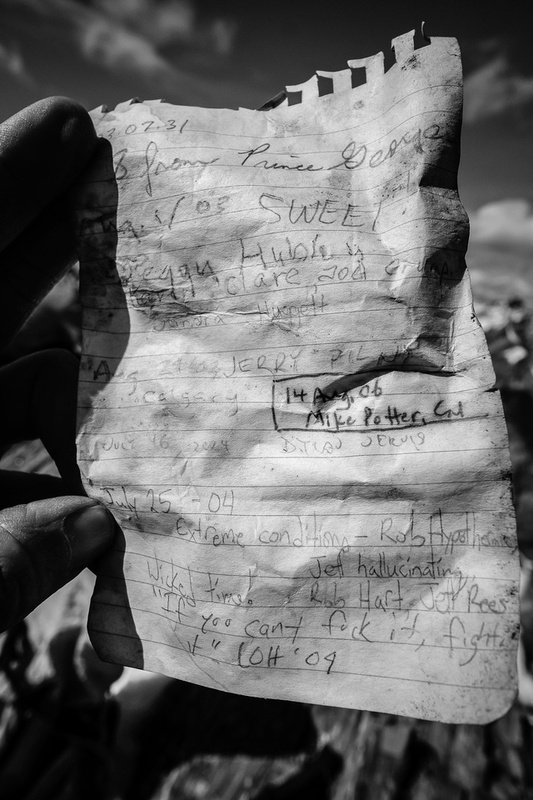 Rick Collier briefly mentions that it’s “easy” in his trip report from his climb of Mount Biddle in 1987 and David P. Jones rates the Southeast Ridge as “Facile” (easy) and 3rd class – the same rating he gives Mount Schaffer which is a hike. This little bit of beta was enough to convince me that this was a moderate scramble at most. 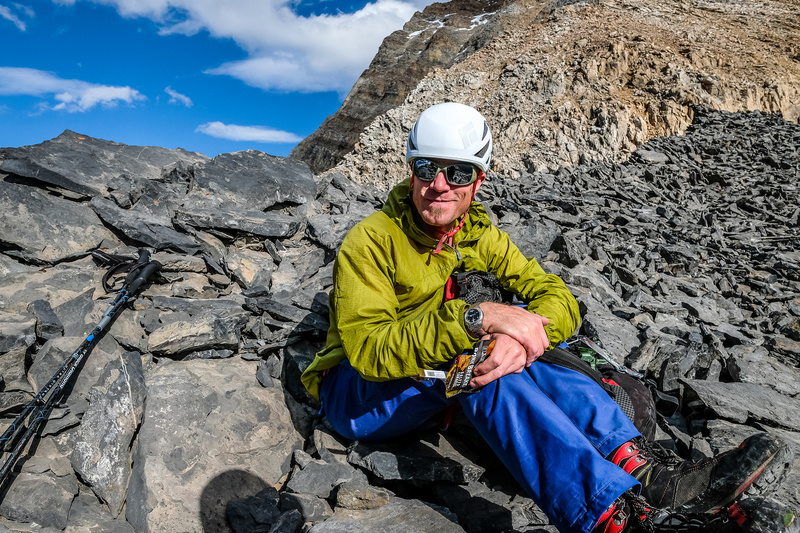 Just a week before our ascent, I read that a friend, Marko Stavrik was also interested in Park Mountain. I figured it was high time I tried the route for myself. 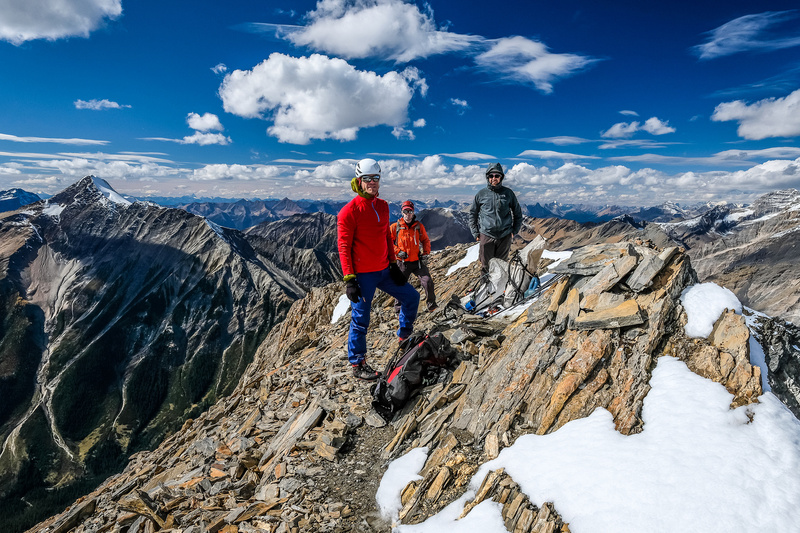 In a funny twist the trip started as a solo plan and ended up being me and three other guys – Anton Baser, Mike Mitchell and Eric Coulthard. 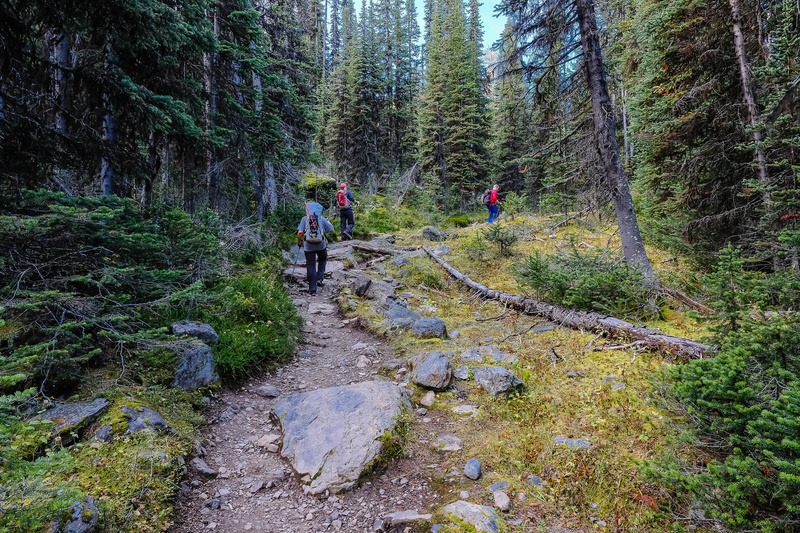 We started from the Lake O’Hara parking lot at 07:30, trying to beat the bus at least half way up the 11km approach road. I have to say that seeing a mouse running around the inside of the car parked next to us was a very strange way to start the day. I still don’t know how the heck it would have gotten in there but that driver was in for a mighty big surprise at some point after their return! 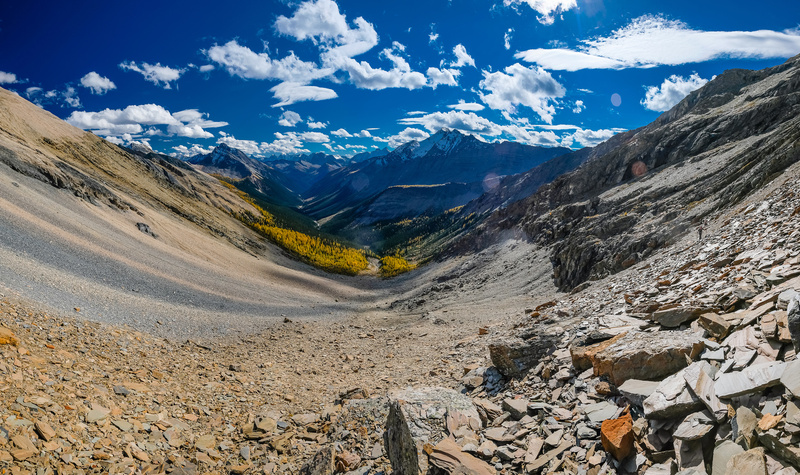 A nice hike towards McArthur Pass. 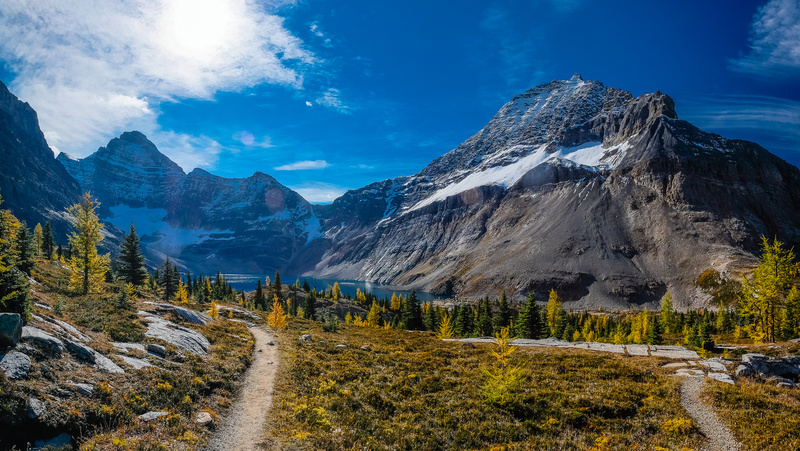 It’s obvious, but walking the 11km approach road definitely adds some effort to the day, no matter what your objective in the Lake O’Hara region might be. 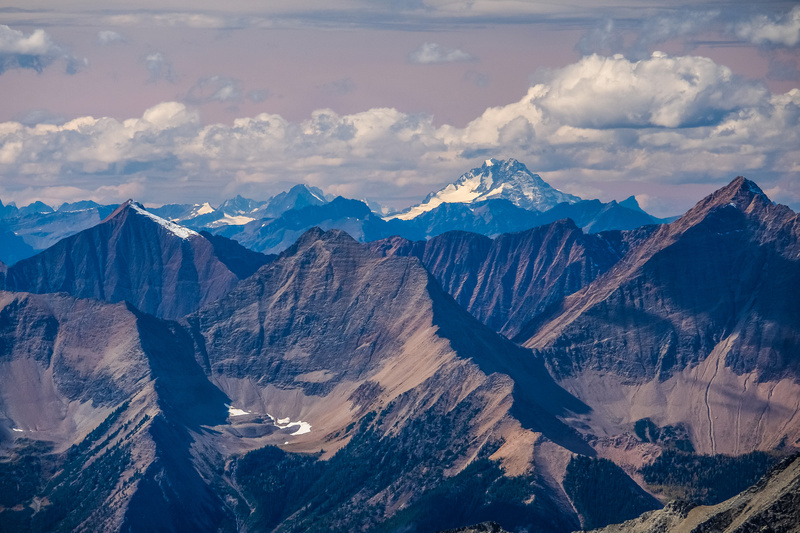 That being said, it always surprises me how many folks let a little thing like 11km and 450m of height gain scare them off from the most beautiful area in the Rockies. It took us under 2 hours to walk the approach road. Mentally I didn’t acknowledge this first part of the day as a part of the scramble. I find that ignoring the first long, boring sections on long days helps my mental focus. 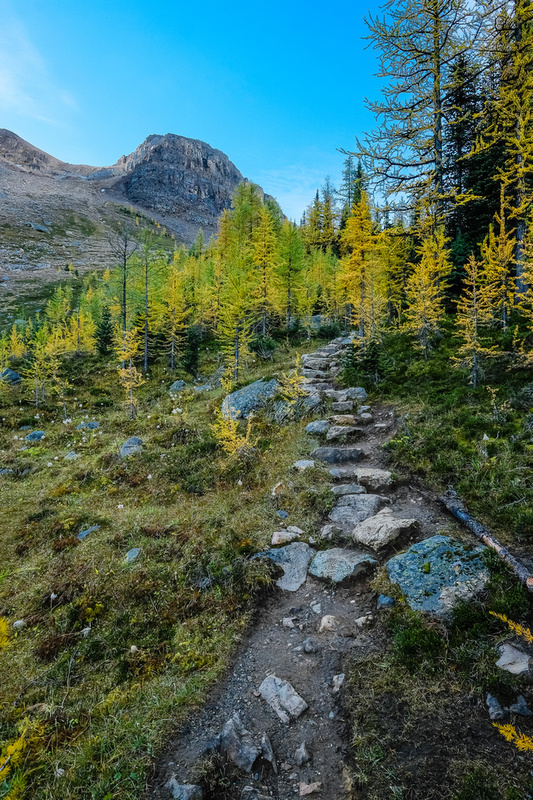 Soon we were walking through brightly colored larches past Schaffer Lake and up towards McArthur Pass. Yes – the larches were out and I was delighted. 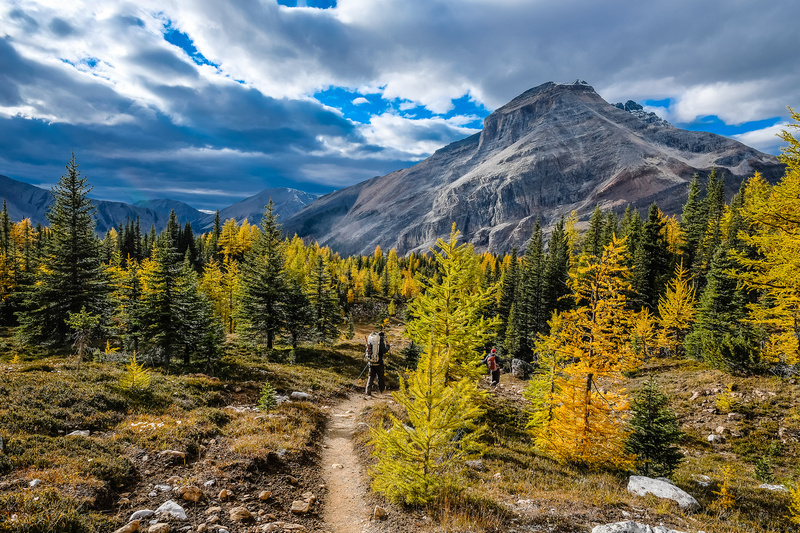 The main reason for choosing Park Mountain at this time of year was the opportunity to hike through some gorgeous larch scenery before getting to McArthur Lake. 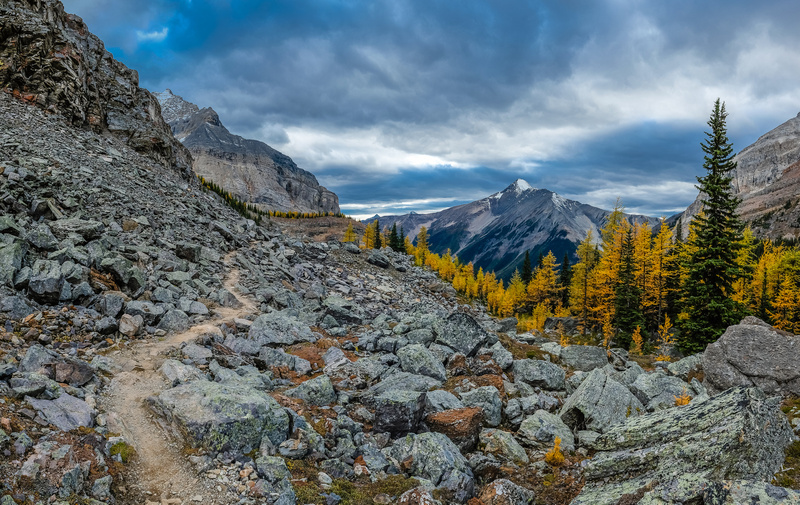 As we hiked through the larches in McArthur Pass we could tell that our timing was perfect. 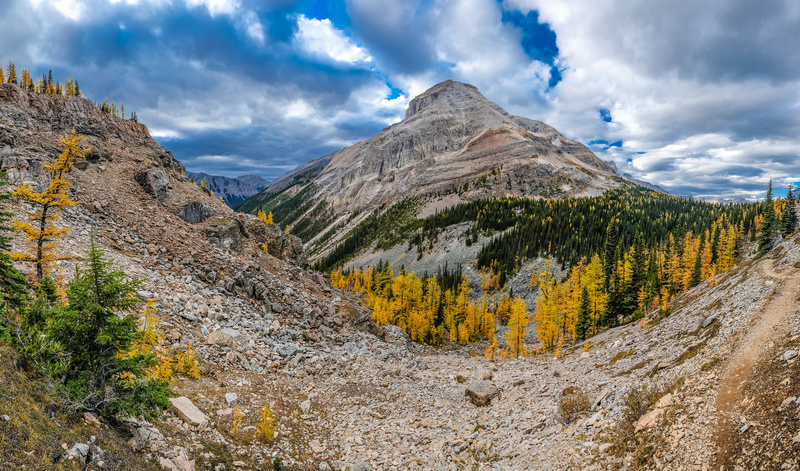 The larches were still a bit green, but the half-turned needles only added to the yellows that were already fully out. Park Mountain looms over McArthur Lake on the right and Biddle looms over everything at left. From the western shore of McArthur Lake our traverse around the south side to the SE end looked a bit gnarly at first. We wondered how the route would go past an obvious slabby section but surmised that it must not be too bad. We were right. 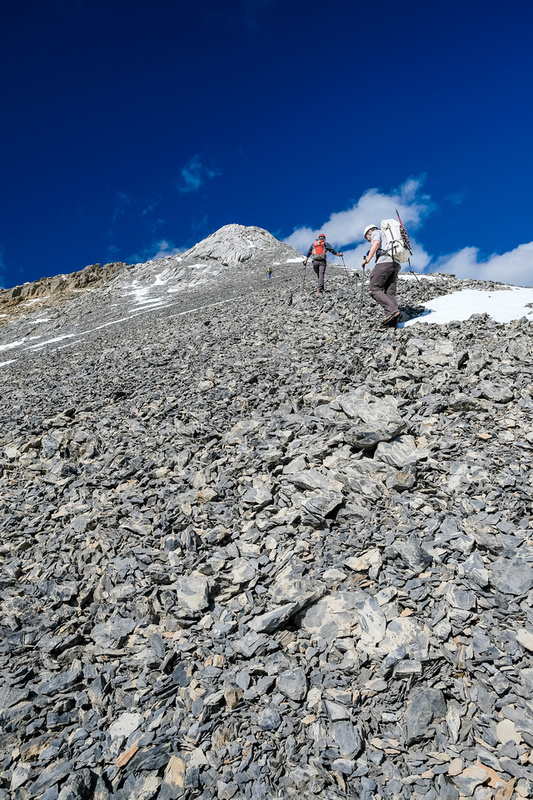 The slabby sections are a bit exposed but with some careful steps we made it through no problem and were soon bashing our way along scree and boulders to the far SE corner of the lake where our route to Biddle Pass started. 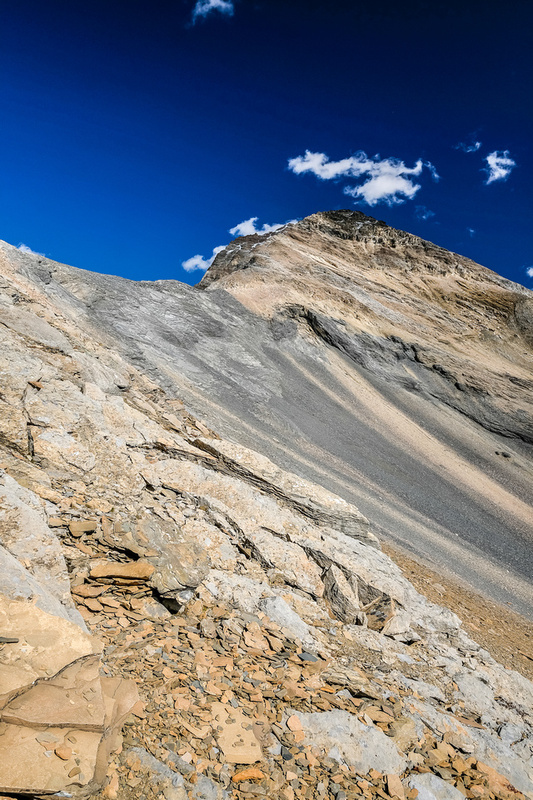 This slope also looked a bit intense from afar, but as with most routes in the Rockies, once we got our noses into it, the angles eased off and the terrain mellowed out. 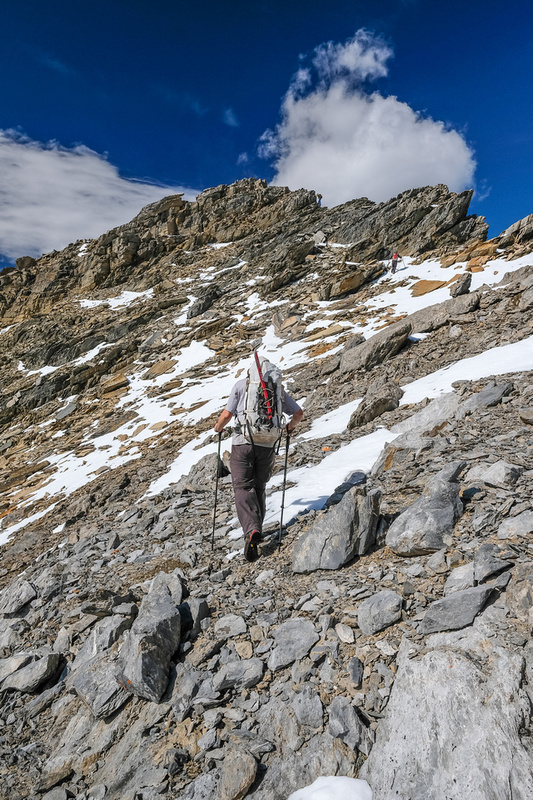 Anton led the way up some wide snow-on-scree before heading left up a narrow snow-filled couloir to Biddle Pass. The snow helped a lot here. 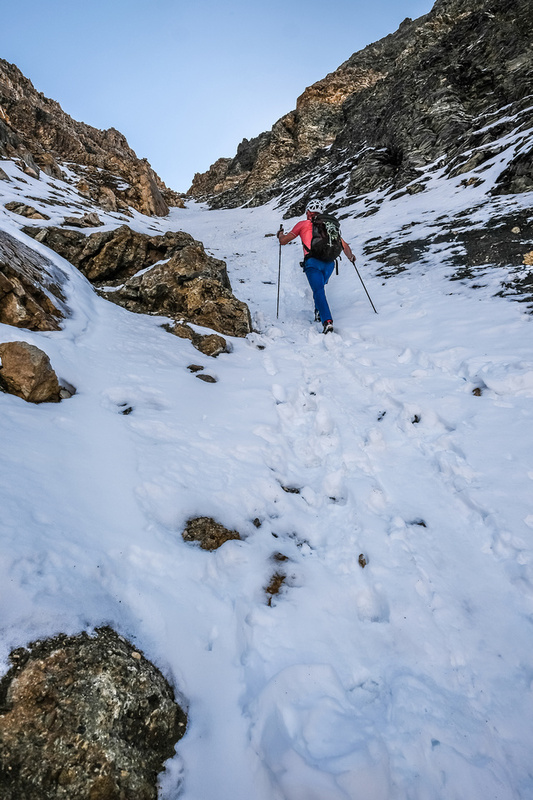 The scree under the snow wasn’t the nice kind. 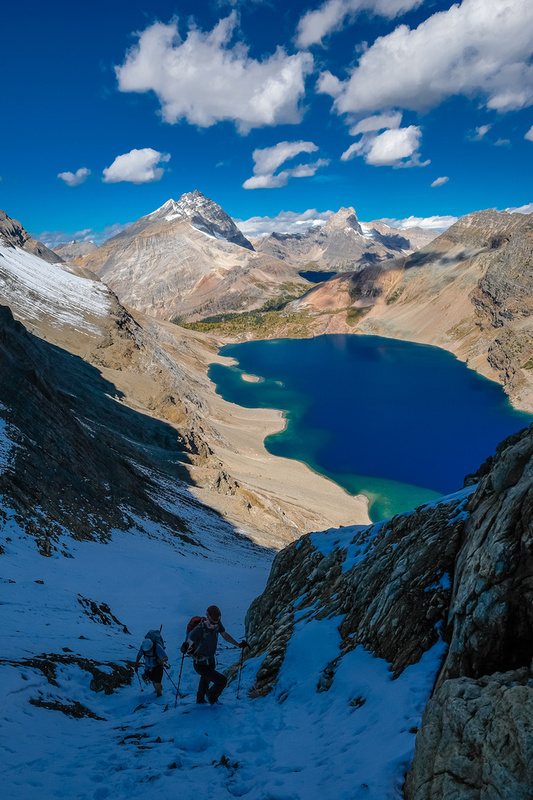 After ascending much further than it looked from the lake we finally topped out at Biddle Pass to some pretty sweet views, both over McArthur Lake and south down Misko Creek. Anton continues to follow the wolverine up to Biddle Pass. 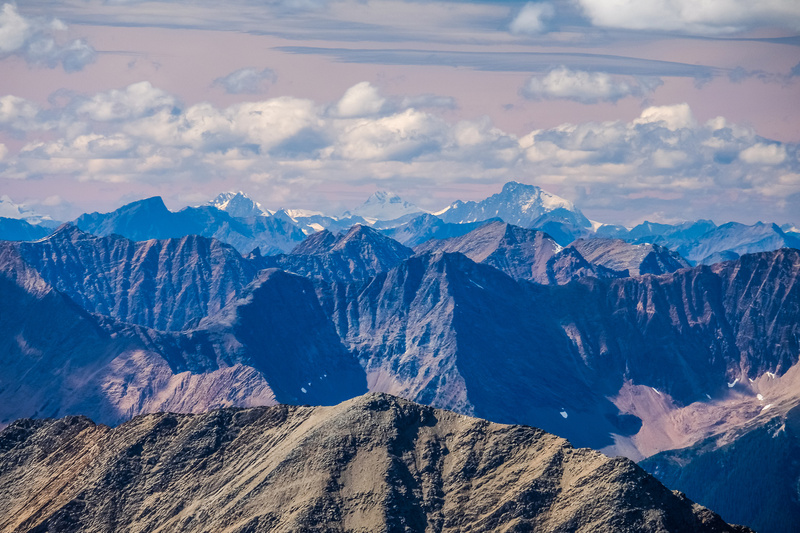 Stunning views from Biddle Pass include the long ridge to the summit of Park on the left, Odaray and Cathedral at center and Schaffer / Whitehead Peak at right. Anton climbs the loose terrain, looking for a route through it. We traversed climber’s left shortly after the photo to a break in the cliff band. 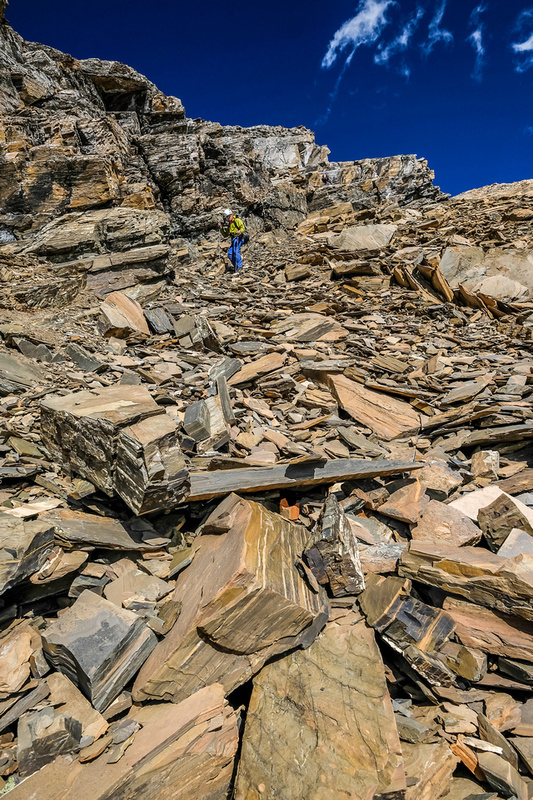 After a short, easy grey band of shale we arrived at a section of down sloping, red and grey slabs and loose, extremely sharp boulders. 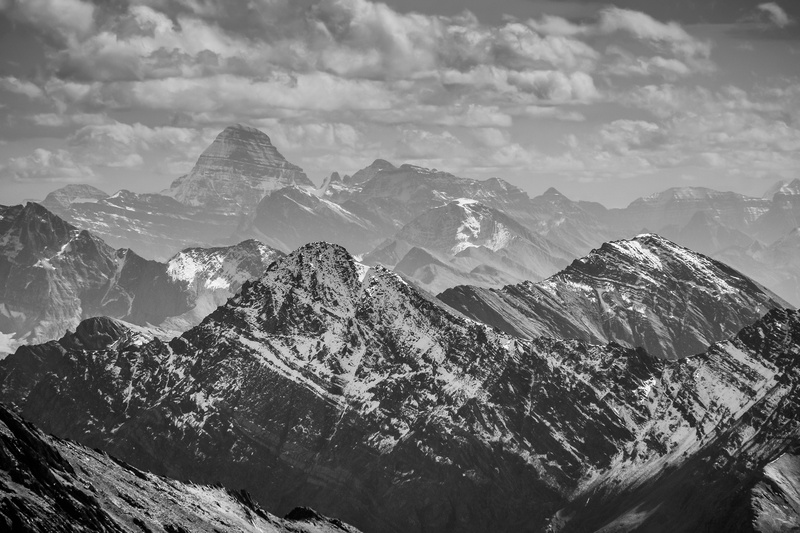 I spotted a cairn fairly soon across this section and descended towards it. Mike tried climbing above the cairn and reported back that it was fairly good, but missing a handhold in a key location. 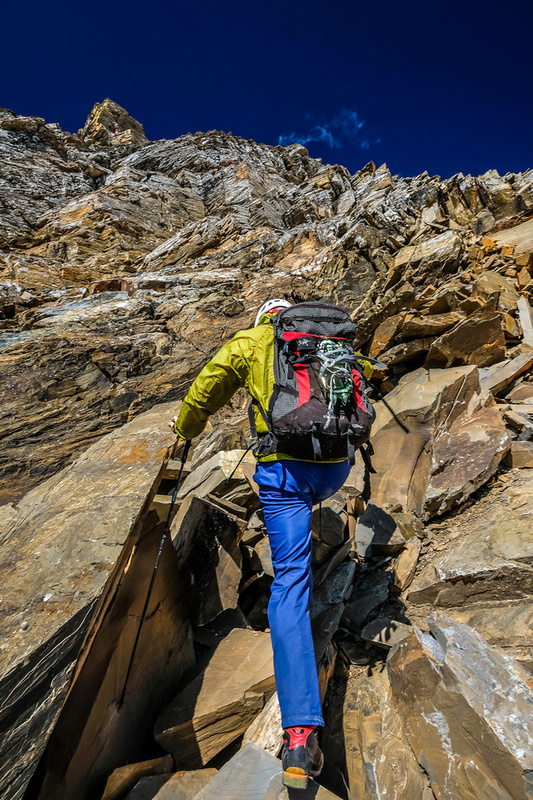 We searched a bit lower down and Anton and I found a route that ascended steep, smooth slabs with few handholds before traversing some extremely loose, steep terrain and finally a short rock chimney to break over the down sloping section. We knew we could descend this section if we had to, but it was upper moderate to low difficult scrambling. From here the route to the summit looked far, but also far simpler. 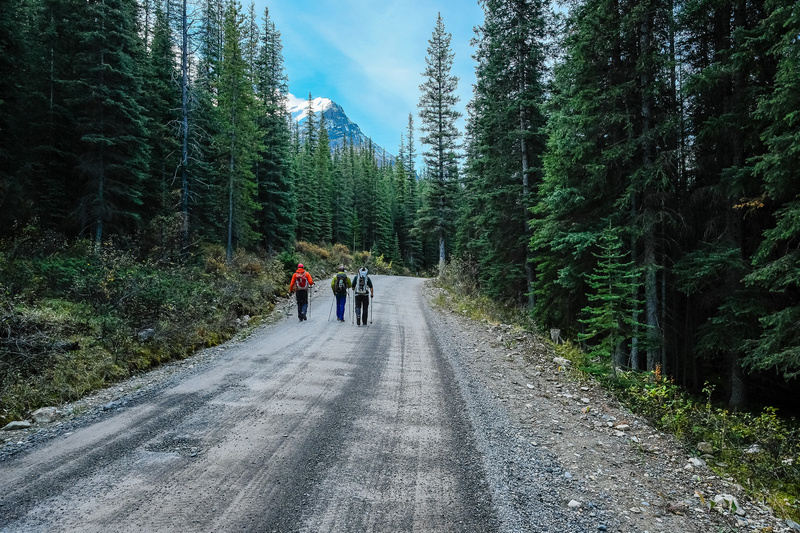 Odaray, Cathedral and the Cataract Brook valley – our long approach up the Lake O’Hara road. The view we came for! Looking over McArthur Lake towards Odaray, Cathedral, Wiwaxy, Victoria, Huber, Schaffer, Lefroy, Ringrose, Whitehead, Hungabee, Biddle and Deltaform (L to R). It took us much longer than expected to reach the easy slopes to the summit, but it was one of those days that you hope never ends, so we weren’t too fussed. From the tricky slabs it was mostly a hike to the summit – much longer than it appeared at first, but pretty easy. 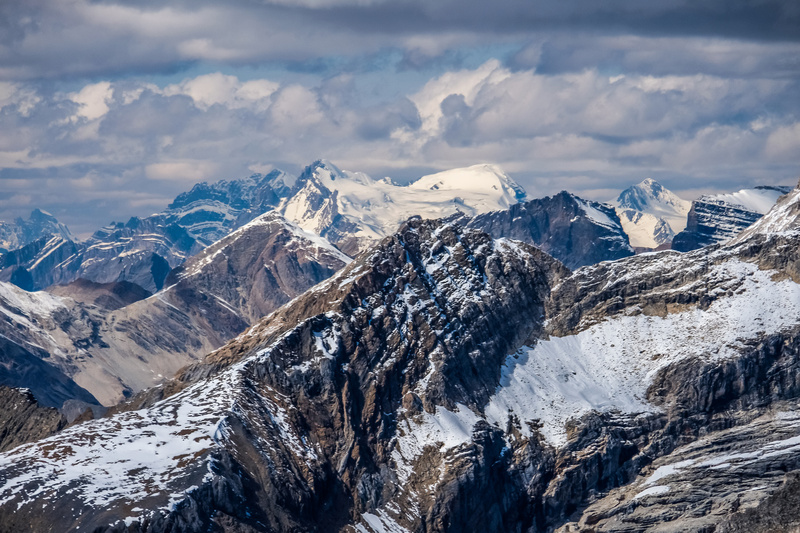 The views from the summit were naturally stunning. The register was only one soggy page with entries from 2004 and 2006. We replaced it with a few more pages and a Ziploc bag so hopefully it lasts a few more years. 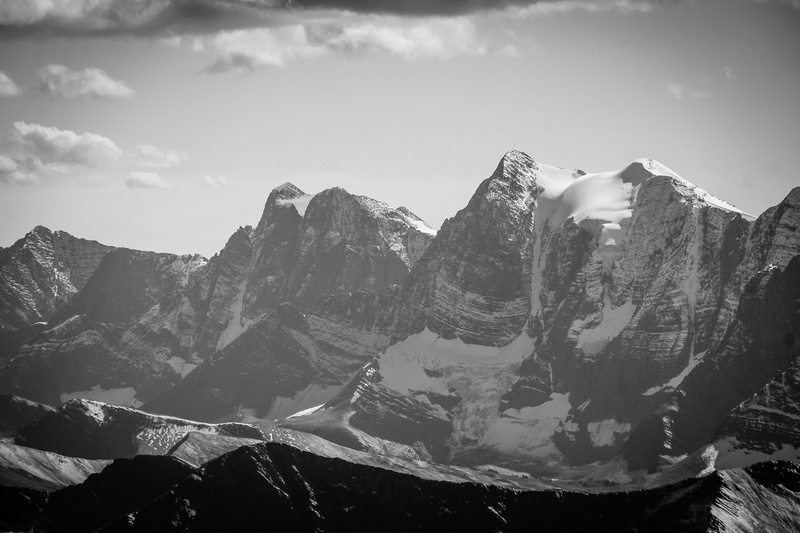 The views towards the Goodsir Towers and some distant BC peaks were especially good. 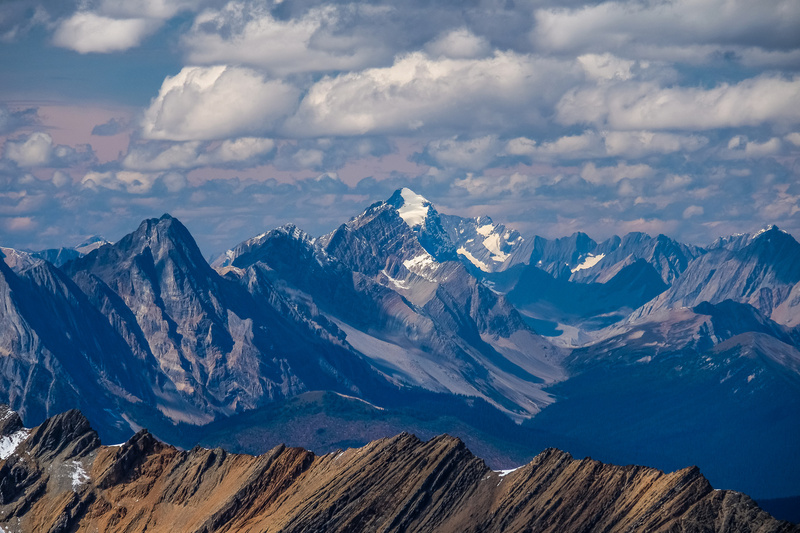 Wapta peaks, Assiniboine and mountains along hwy 93 to Kootenay National Park were also in grand display. 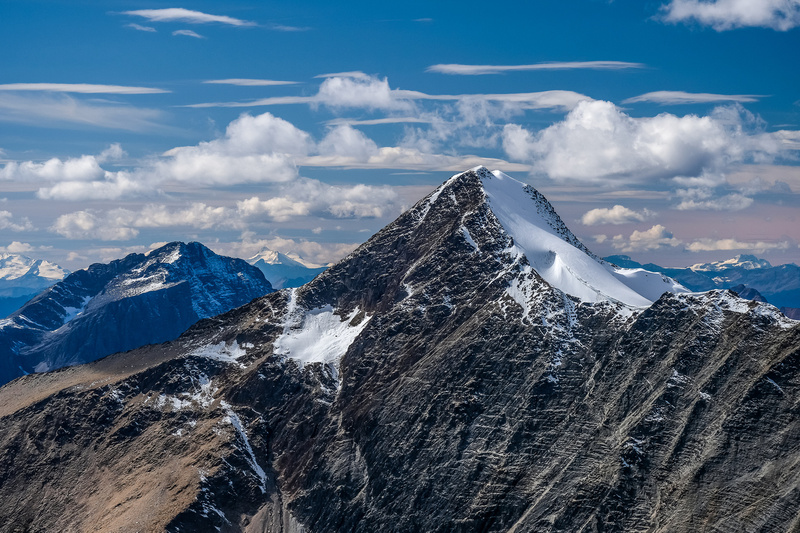 We spent some time taking photos, hydrating and eating and enjoying the hard-won summit before slowly making our way back along the southeast ridge. 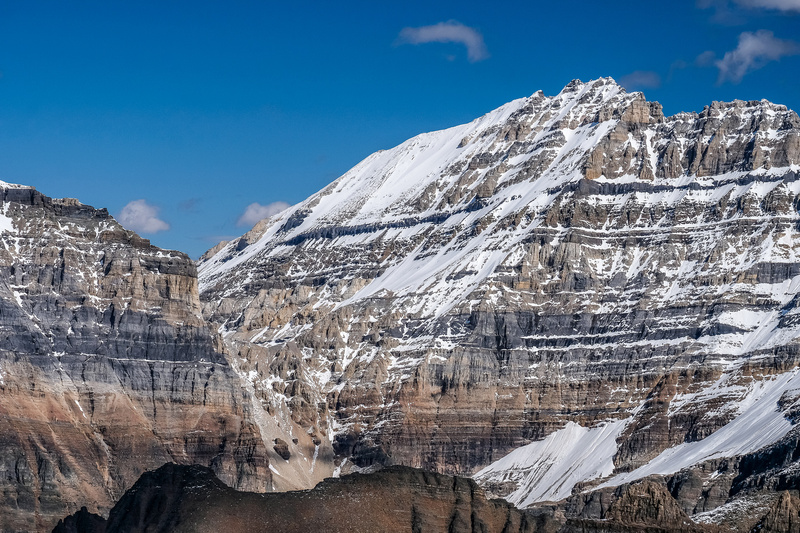 Yep – there’s some exposure along the summit ridge – but not too bad. On descent we followed our up-track along the SE ridge until the crux, slabby, down sloping section. Here we spit up. Anton descended the tougher terrain and found that if he stuck to the original line that Mike had tried there was only the one tricky move with minimal holds but other than that he made it through no problems and ended up around 15-20 minutes ahead of us. Mike, Eric and I looked for an easier bypass to the south of the ribs and found one. The only catch? More elevation loss and regain. Our route changed the overall scramble to a moderate so it’s worth following if that’s your preference, otherwise the slabs are a shorter way to go. 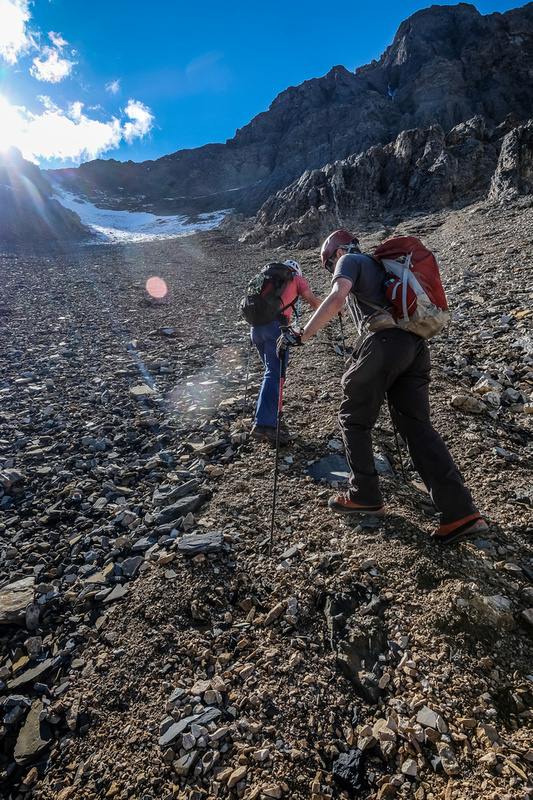 After another break at Biddle Pass we descended the snow and scree slopes to McArthur Lake and headed back around the south shores. Gorgeous hiking with Little Odaray rising in the background. 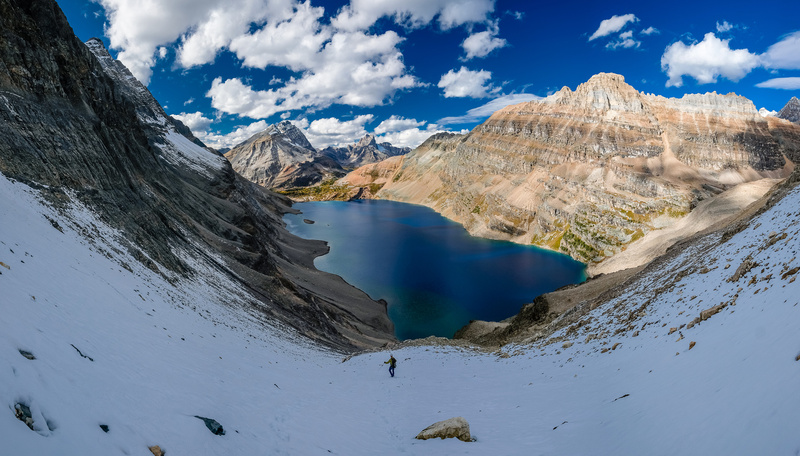 From the west shores of McArthur Lake, we followed the Low Level McArthur Pass trail for variety and grunted our way back up to McArthur Pass and then down through brilliant larches towards Schaffer Lake. We made the last bus of the day within 10 minutes of it leaving at 18:30! Thankfully there was still room and we managed to hitch a ride down the 11km road back to the parking lot. Park Mountain was more work than expected but it was a great day out and I was happy to have the company of some good friends to share it with. 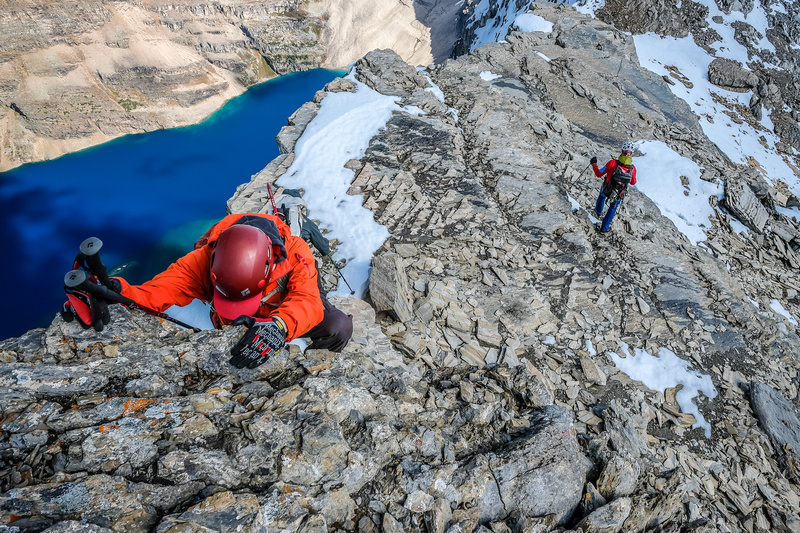 A highly recommended Lake O’Hara summit for determined scramblers who might have the easy ones already completed, just don’t expect it to be quite as easy as Mount Schaffer. 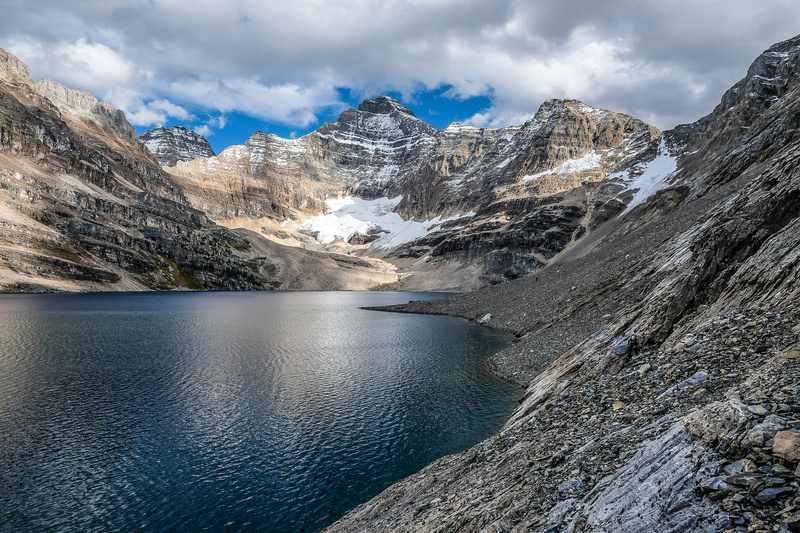 The Lake O'Hara road is long at around 11km and gains about 450m of height too - not insignificant on a long day like scrambling Park Mountain. 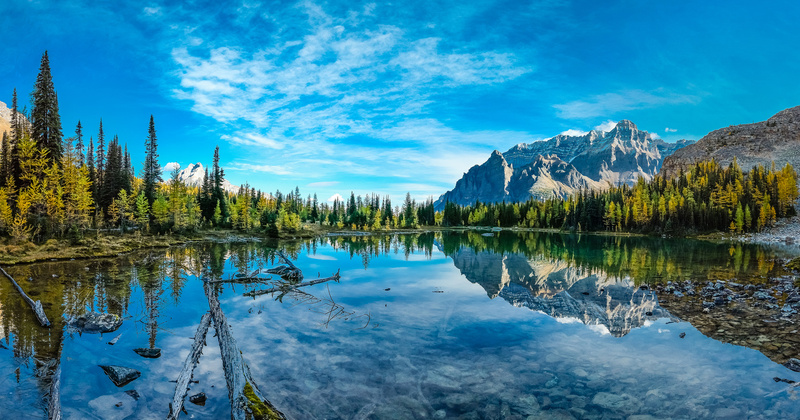 Schaffer Lake never disappoints with great views back towards Wiwaxy Peaks and Mount Huber. The larches were just turned - the light green needles were a nice boost to the yellow ones already turned. 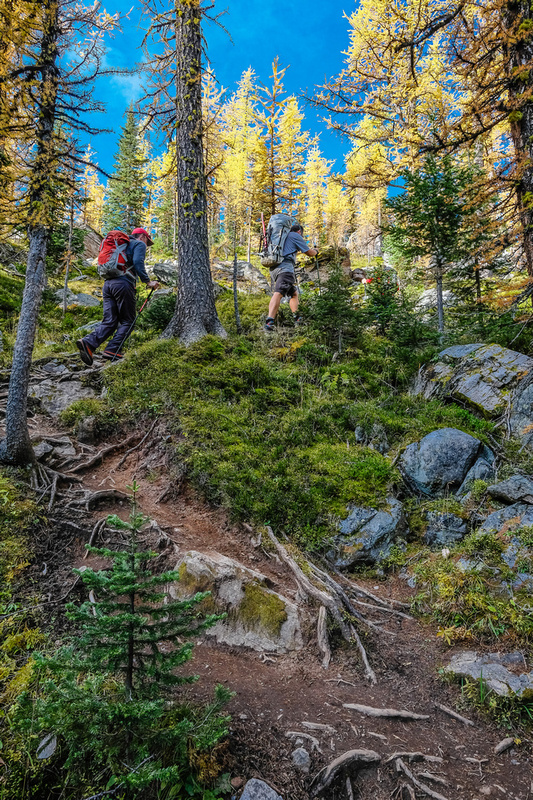 Steep hiking to McArthur Pass from Schaffer Lake. Incredible morning views including Park Mountain looking very lofty at upper left, Mount Owen at center and Odaray at right. A beautiful morning at McArthur Lake. It was hard not to just lie down for a nap here! Park at upper right, Biddle at center distance and Schaffer at left. Good grip is essential for this scramble - both alongside the lake and much higher up where you once again will encounter slabs. Looking back at McArthur Lake from its SE corner. 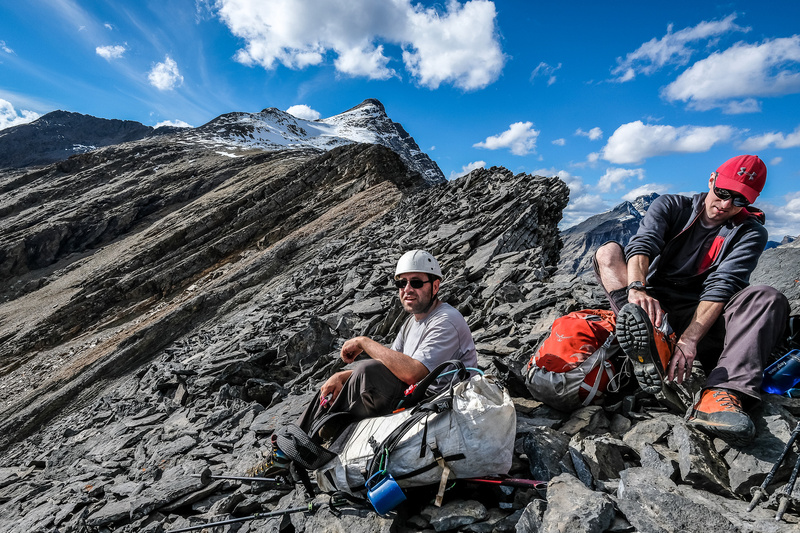 Anton and Mike start the long grunt up talus towards Biddle Pass high to the left here. 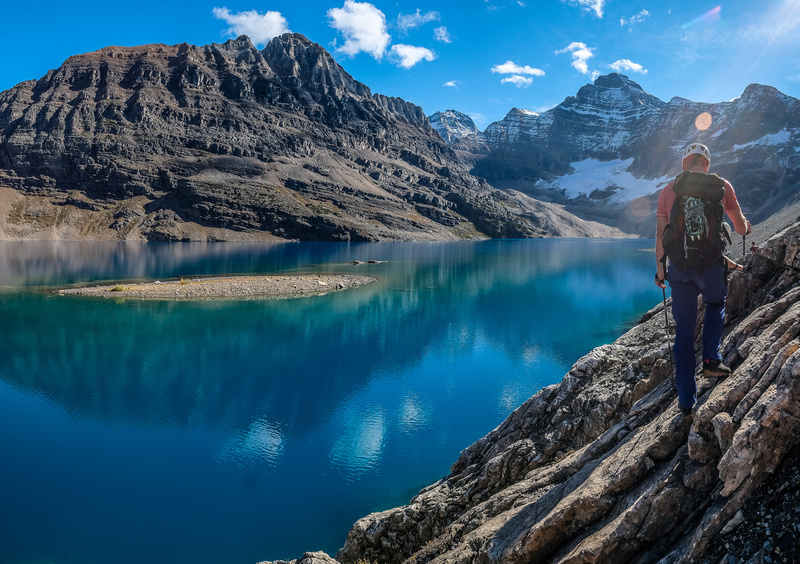 The view of McArthur Lake was a nice distraction behind us as we grunted up to Biddle Pass. 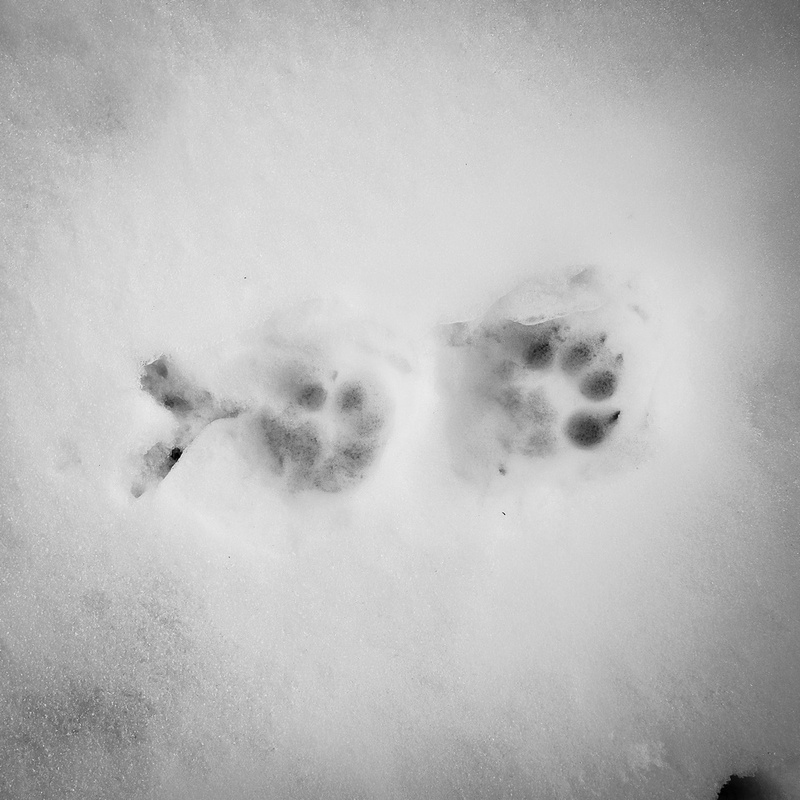 We're reasonably confident that we followed a wolverine up to Biddle Pass which is pretty cool. 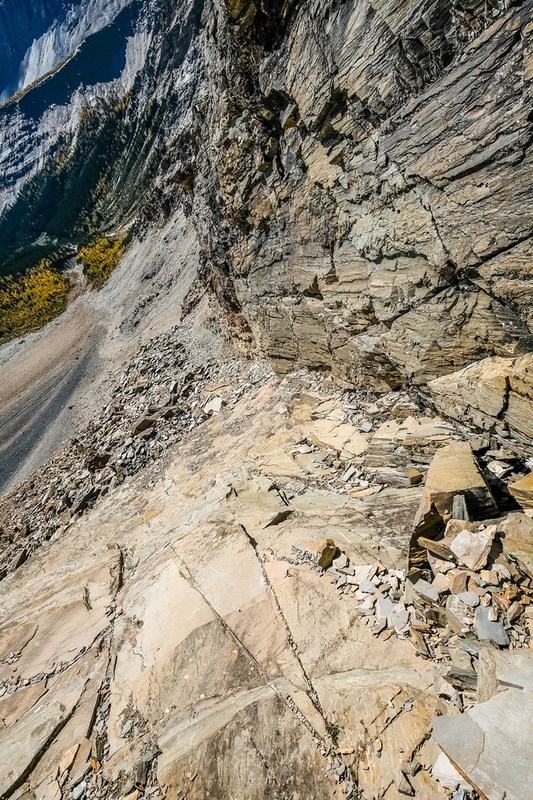 Caution is required when the slope narrows to a steeper couloir due to rock fall. Note the grey rock behind the guys that we traversed from Biddle Pass, Biddle rising at upper left. Looking for a reasonable line through the down sloping shale / slab terrain. The rocks here were very unstable and very, very sharp. Looking down the smooth slab that we ascended up beside one of the down sloping ribs. Anton climbs the loose terrain, looking for a route through it. We traversed climber's left shortly after the photo to a break in the cliff band. Spot Eric and Mike below? We traversed over the cliff band up the crack obvious at right here. Finally the route to the false summit looks straight forward! It took us MUCH longer than expected to make it this far, but it's a gorgeous day so nobody's complaining too loudly. 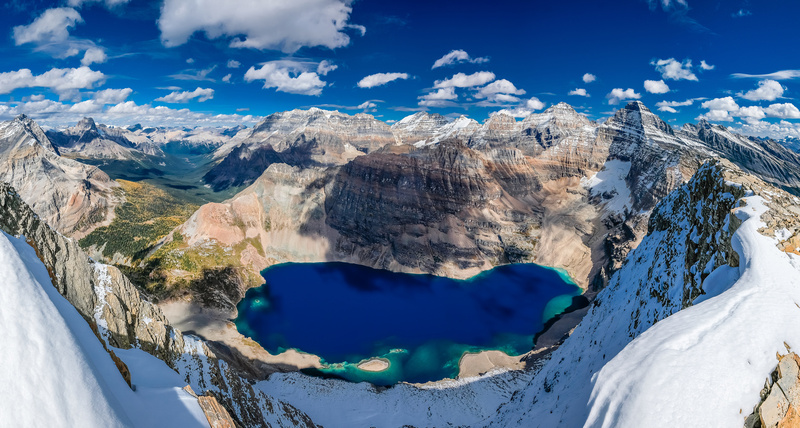 Grand views over McArthur Lake and the southeast ridge. We are much higher than Wiwaxy, Yukness and Schaffer already at this point. More steep, loose slopes to the false summit. 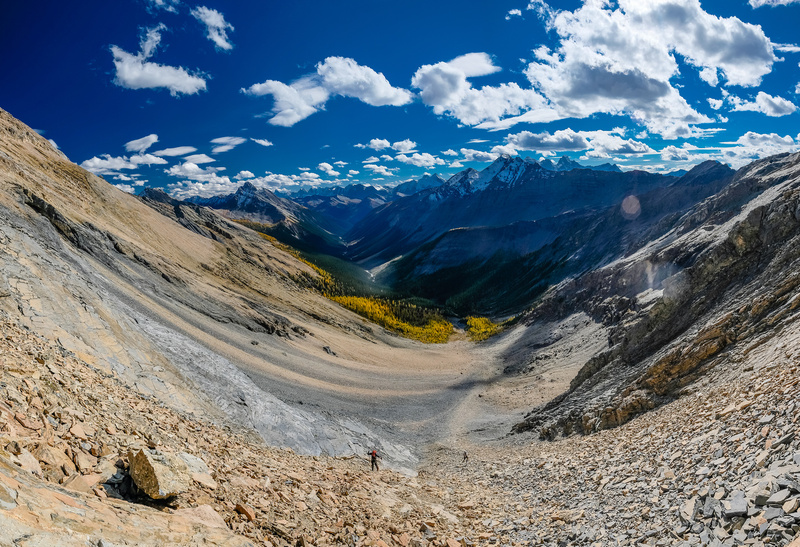 Great views into the McArthur Creek Valley with the Goodsirs at center distance and Owen at right. 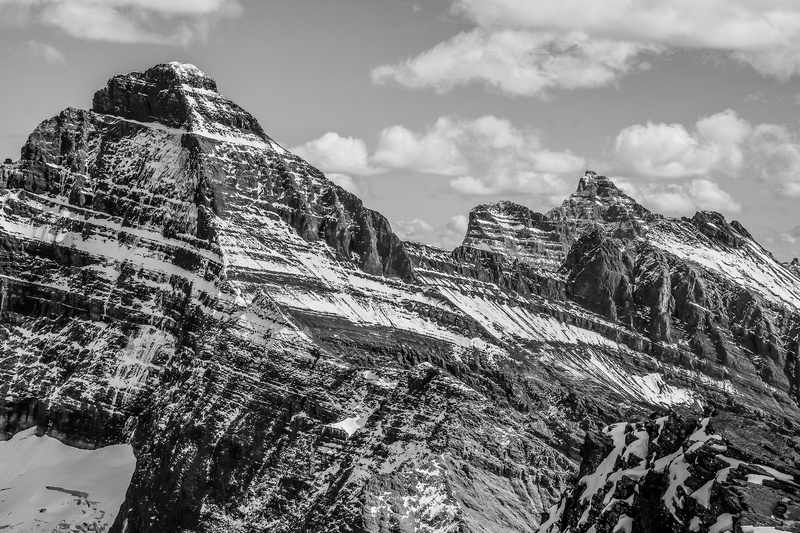 The incredible north faces of Sentry, Goodsir South, Center and North. 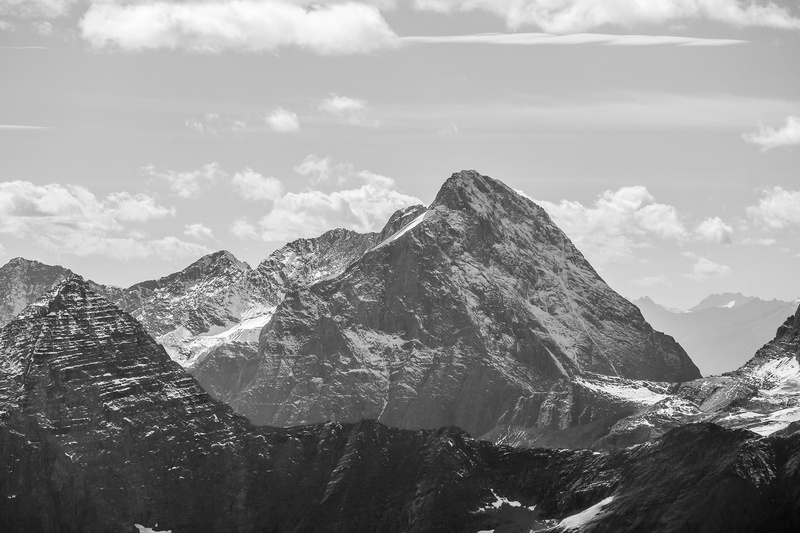 harp Mountain rises over Misko in the foreground. 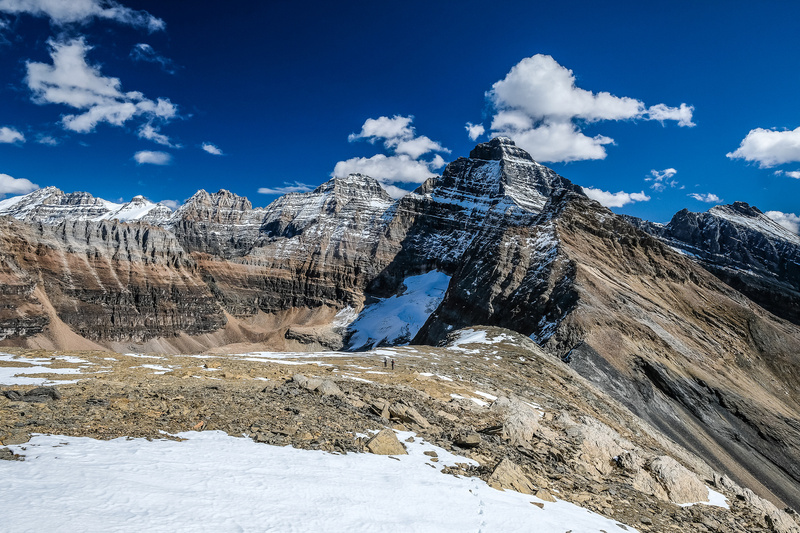 We aren't that much lower than the gorgeous Mount Owen. 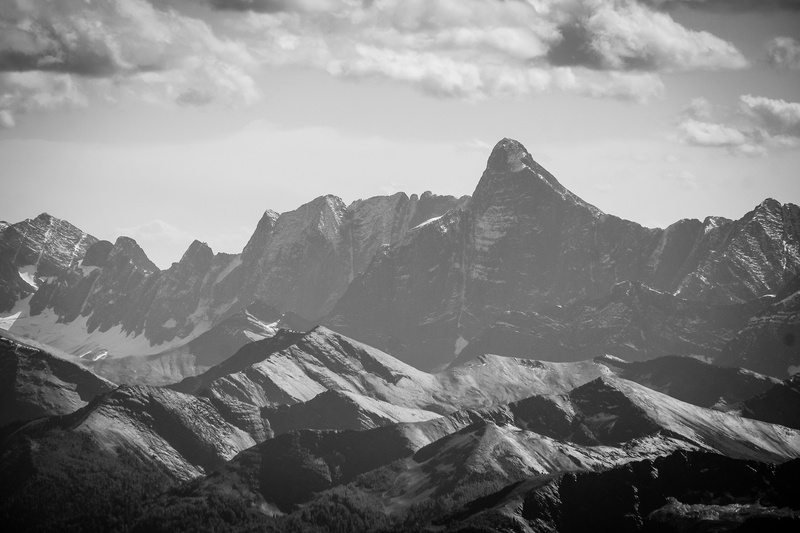 The unmistakable form of Mount Sir Donald looming far to the west in the Purcell Mountain Range. Looking over some striking red-tinged peaks towards Mount Rogers. 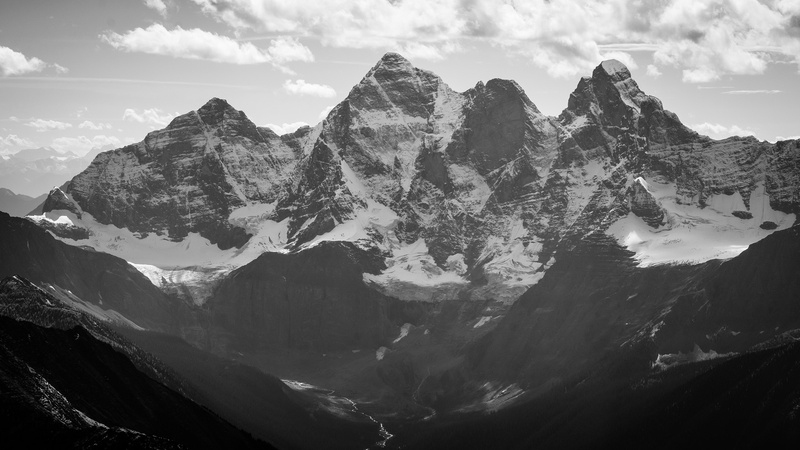 Another obvious shape - Mount Laussedat. 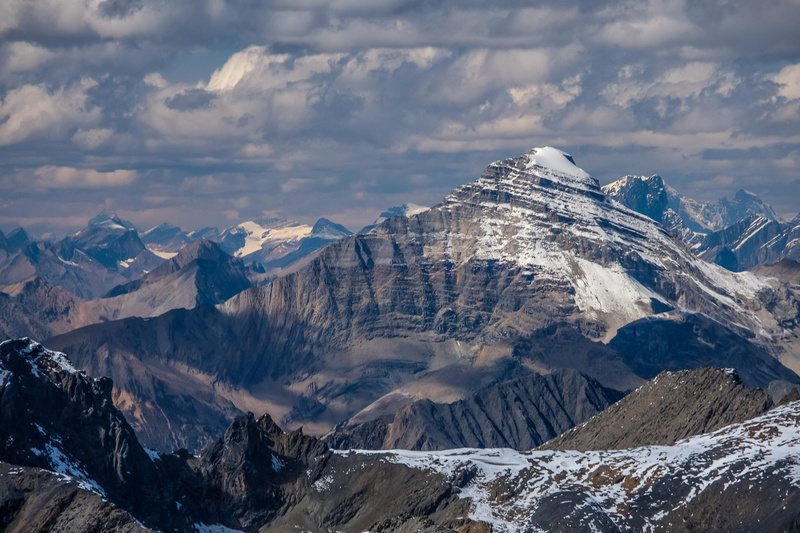 Looking south towards Tumbling Peak. Looking over Yukness towards Lefroy and Ringrose. Mount Collie (L) and Baker. 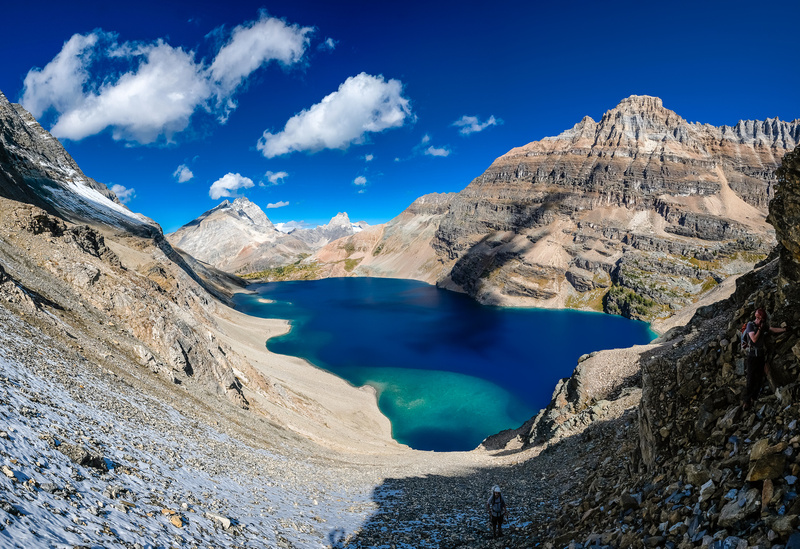 Odaray, Cathedral and the Cataract Brook valley - our long approach up the Lake O'Hara road. Biddle (L) doesn't look that easy! Deltaform at right isn't easy either. The boyz at the summit of Park Mountain. Looking over McArthur Lake towards Odaray, Cathedral, Wiwaxy, Victoria, Huber, Schaffer, Lefroy, Ringrose, Whitehead, Hungabee, Biddle and Deltaform (L to R). 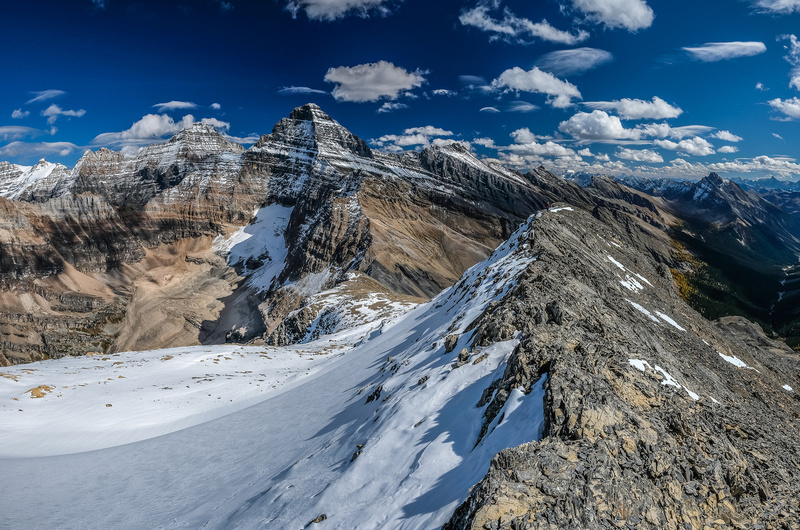 Yep - there's some exposure along the summit ridge - but not too bad. The views certainly didn't get any worse on the way down! Mike, Eric and I find an easier way around the down sloping slabs / ribs. Looking over the down sloping ribs over the grey band towards lower Biddle and Biddle Pass. 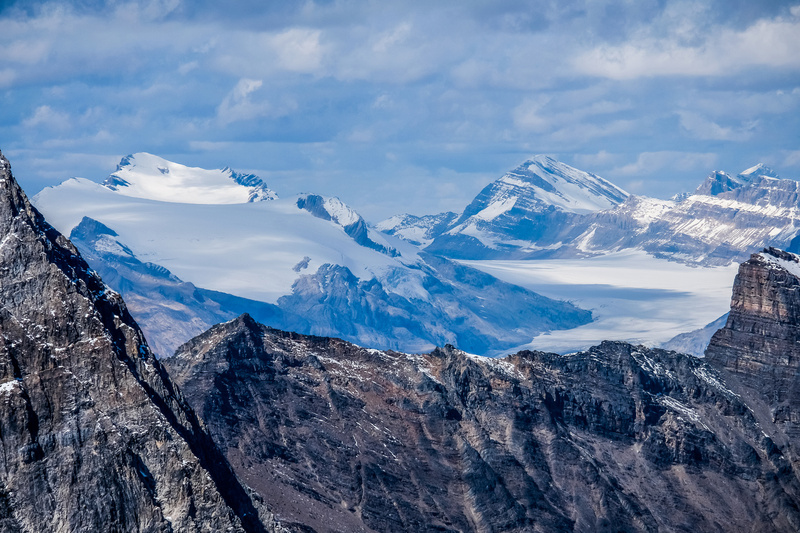 We break through the cliff bands south of the SE ridge and beneath the ribs. Now we have to regain 150m to the ridge though! 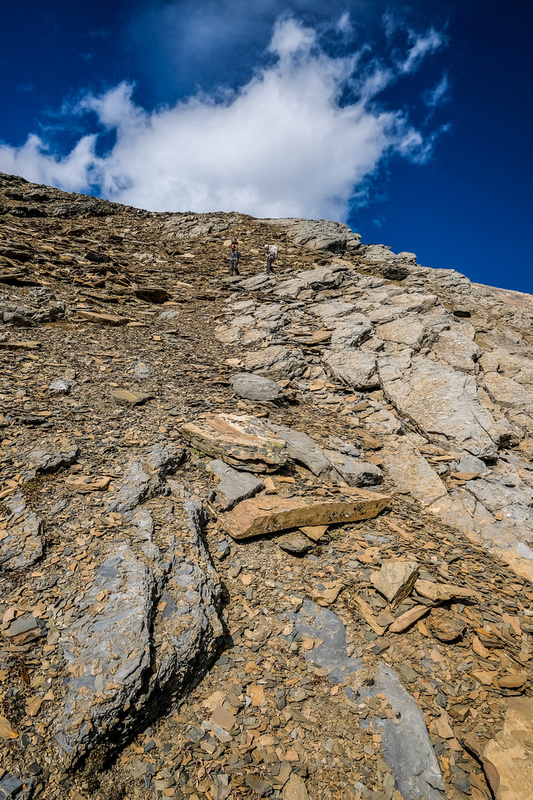 Mike and Eric follow me up scree slopes alongside the slabs / ribs we avoided at right. Eric and Mike back at Biddle Pass. 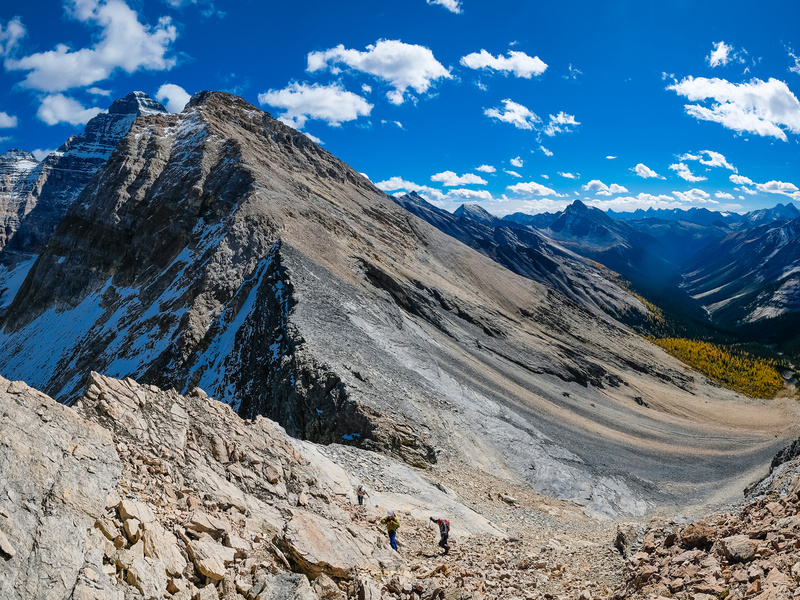 Descending steep snow and scree towards McArthur Lake. 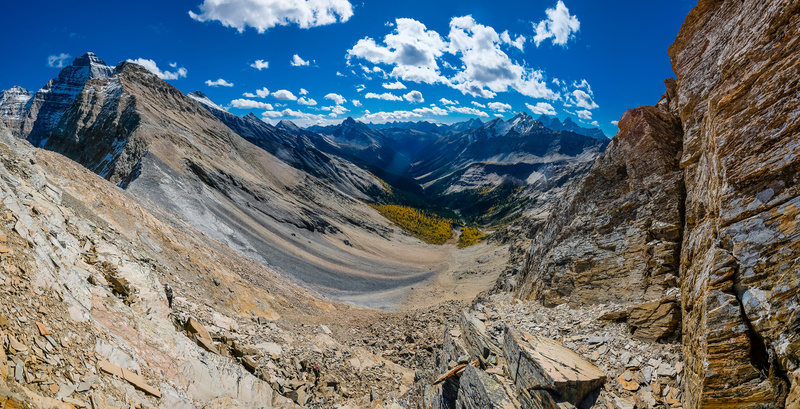 Looking back along McArthur Lake towards Biddle (L) and Biddle Pass (R). 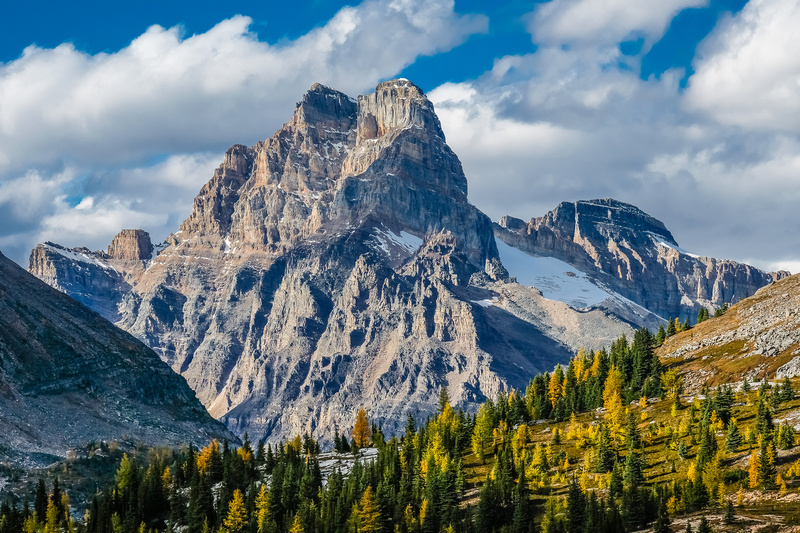 Lovely views of Cathedral Mountain looming over McArthur Pass. 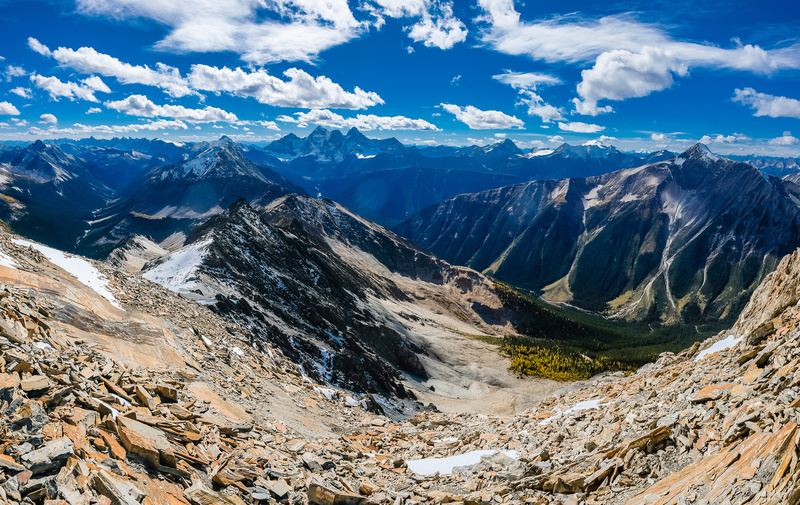 Amazing views of Biddle and Park, looking pretty big from the Lower McArthur Pass route. 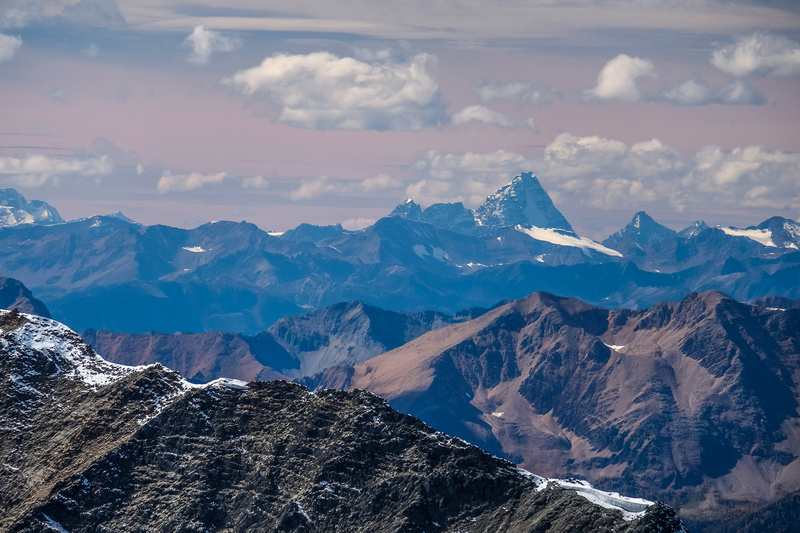 More great views towards Little Odaray and McArthur Pass (R). A last view back at Park in upper left and Owen in the distance. 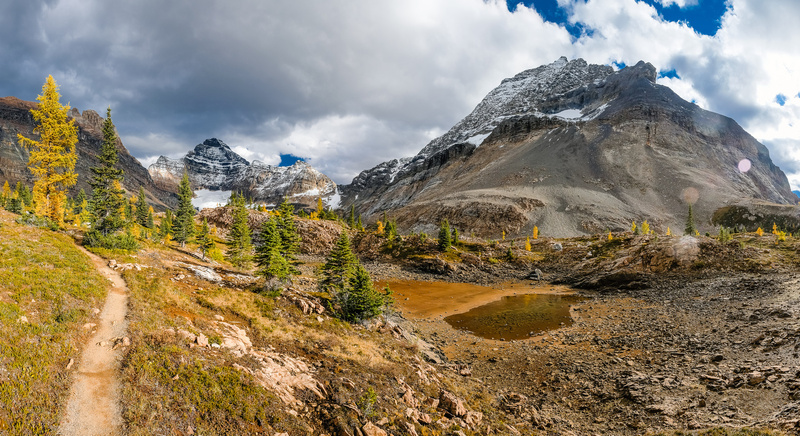 Lake O'Hara with Wiwaxi Peaks looming above at left.